The Braille Club is now available to Kindle Prime and Unlimited subscribers so what are you waiting for download your free digital edition of The Braille Club today! J.A. Kerr on Marketing Newly Released Book The Braille Club: A Marathon not a Sprint! Have been working all week on my website of the do-it-yourself variety and its not as hard as I thought. I was dreading it to be honest, but all my research points to needing one, so that’s been my focus today. 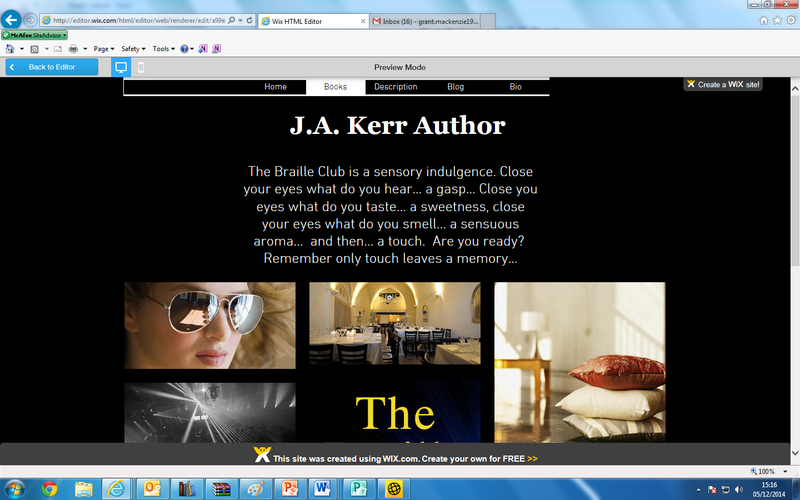 I’ve spent a lot of time looking up author websites for inspiration and content ideas but none seem to fit with The Braille Club so I’ve been very brave and put together my own ideas. I have shared my webpage content on face book to gain feedback and will alter accordingly. Hoping to go live next week another first in the life of a newly published author! Well today has been another steep learning curve as I navigate my way through website after website to gain inspiration on the burning issue of HOW TO SUCCESSFULLY MARKET MY BOOK! This morning was spent oohing and aahing over my business cards, they look great. I will be distributing them around family and friends as word of mouth is an author’s friend as well as a powerful marketing tool. My mum had told all her friends which was fantastic… until she realised she’d given them the wrong pen name. I’m hoping the business cards will solve any further confusion and act as a gentle reminder, should someone be interested enough to buy. A week has passed since my book became available through Amazon, Nook and Kobo and as Charlie succinctly put it “It was the best of times, it was the worst of times.” — Charles Dickens, A Tale of Two Cities. For everyone who ordered and purchased my book thank you!!! For me that was the best of times full of excitement and now I wait on tender hooks for some feedback and it feels like the worst of times. My nails are bleeding stumps and it’s all I think about, please be gentle with me, kind and constructive. My writer ego is terrified! Anyway since I am unknown and trying to carve out an identify as a writer I have no other choice but to nike my ironing… the joys! The Braille Club, Inspirational Reads and Blogging! I am avid reader and author and I like lots of different genres but they all have one thing in common, page turners, they grip me as soon as I begin to read. I wanted this with my own book which I was inspired to write since forever but only got around to it now. I remember reading Coma by Robin Cook and being utterly enthralled but equally loving the poignant romance of Jane Eyre by Charlotte Brontë. 1.The Help by Kathryn Stockett a wonderful story that made me laugh and cry. 2.The Hypnotist by Lars Kepler scary book. 3 The Gargoyle by Andrew Davidson this book is different read it to see why. 4. Snow Flower and the Secret Fan by Lisa See wonderful. 7. Harry Potter by JK Rowling. 9. The Lovely Bones by Alice Sebold so sad. 11. The Drop by Howard Linskey David Blake series. 12. Original Skin by David Mark. 20. Bring up the Bodies by Hilary Mantel. 33. Memoires of a Geisha by Arthur Golden. I loved this joke it wanted to apply it my own genre but not brave enough but rest assured my readers are getting the full package and not The Braille Club II just as hot! Stephen King, Janet Evanovich, and James Patterson were hanging out at a coffee shop bragging about how loyal their readers were. And with that, Tom Wolfe strolled away. A literacy joke is risky to tell because most people either don’t care about reading and writing or won’t have enough background information to understand it. Even if the audience “gets” it, chances are they’ll still think the joke isn’t funny. You don’t need a master’s degree in English to “get” a Best Literacy Joke Ever! You might need to read a book every once in a while, though. WARNING! Just because a Best Literacy Joke Ever is easy to understand, that doesn’t make it funny. It’s tough to write (and tell) a Stephen King joke.